Ransomware is malware for data kidnapping, an exploit in which the attacker encrypts the victim's data and demands payment for the decryption key. After a victim discovers he cannot open a file, he receives an email ransom note demanding a relatively small amount of money in exchange for a private key. The attacker warns that if the ransom is not paid by a certain date, the private key will be destroyed and the data will be lost forever. The malware surreptitiously encrypts the victim's data but does nothing else. In this approach, the data kidnapper anticipates that the victim will look on the Internet for how to fix the problem and makes money by selling anti-ransomware software on legitimate websites.To protect against data kidnapping, experts urge that users backup data on a regular basis. If an attack occurs, do not pay a ransom. Instead, wipe the disk drive clean and restore data from the backup. 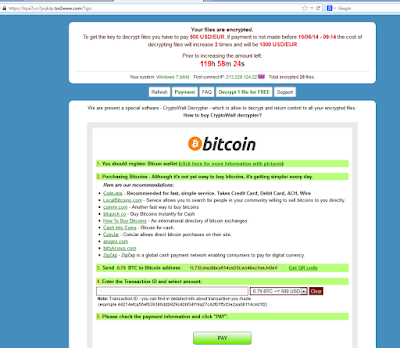 Ransomware is a sophisticated piece of malware that blocks the victim’s access to his/her files. "There are two types of ransomware in circulation:"
"Encrypting ransomware:" which incorporates advanced encryption algorithms. It’s designed to block system files and demand payment to provide the victim with the key that can decrypt the blocked content. Examples include CryptoLocker, Locky, CrytpoWall and more. "Locker ransomware:" which locks the victim out of the operating system, making it impossible to access the desktop and any apps or files. 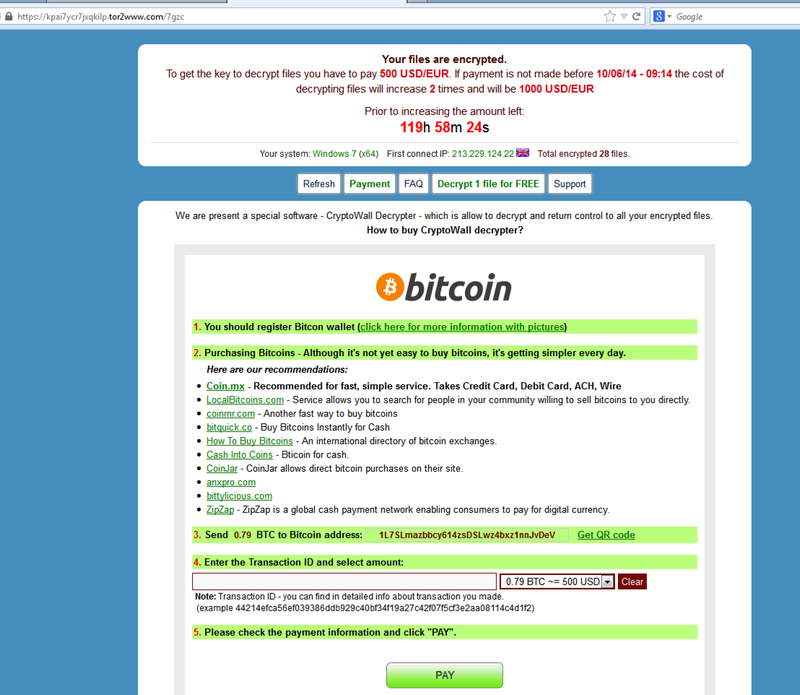 The files are not encrypted in this case, but the attackers still ask for a ransom to unlock the infected computer. 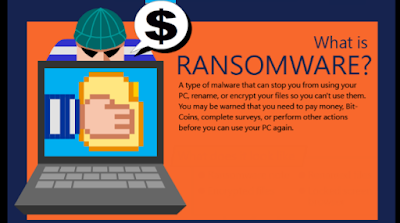 Examples include the police-themed ransomware or Winlocker. "Ransomware has some key characteristics that set it apart from other malware:"
Usually, the ransom payments has a time-limit, to add another level of psychological constraint to this extortion scheme. Going over the deadline typically means that the ransom will increase, but it can also mean that the data will be destroyed and lost forever. "Where does the current wave of ransomware infection come from?" Even though most companies have extensive security mechanisms in place, such as virus scanners, firewalls, IPS systems, anti-SPAM/anti-virus-email-gateways and web filters, we are currently witnessing large numbers of infections worldwide with ransomware infections, such as Cryptowall, TeslaCrypt and Locky. Files on computers and network drives are encrypted as part of these infections in order to blackmail the users of these computers to pay a sum of money, usually in the region of USD 200-500, for the decryption tool. "A common infection scenario may look like this:"
A user receives an email that comes from a seemingly plausible sender with an attached document, a parcel service with attached delivery information or anexternal company with an attached invoice. It tries to download the actual ransomware payload from a series of webaddresses that only exist momentarily. If a web address cannot be reached, thenext one is accessed until the payload has been downloaded successfully. "The macro executes the ransomware"
The ransomware contacts the command & control server of the attacker,sends information about the infected computer and downloads an individual public key for this computer. Files of certain types (Office documents, database files, PDFs, CAD documents,HTML, XML etc.) are then encrypted on the local computer and on all accessible network drives with this public key. Automatic backups of the Windows operating system (shadow copies) are often deleted to prevent this type of data recovery. "Best practices to apply immediately"
Backup regularly and keep a recent backup copy off-site. There are dozens of ways other than ransomware that files can suddenly vanish, such as fire, flood, theft, a dropped laptop or even an accidental delete. Encrypt your backup and you won’t have to worry about the backup device falling into the wrong hands. Be cautious about unsolicited attachments. The crooks are relying on the dilemma that you shouldn’t open a document until you are sure it’s one you want, but you can’t tell if it’s one you want until you open it. If in doubt, leave it out. Don’t give yourself more login power than you need. Most importantly, don’t stay logged in as an administrator any longer than is strictly necessary, and avoid browsing, opening documents or other “regular work” activities while you haveadministrator rights. Consider installing the Microsoft Office viewers. These viewer applications let you see what documents look like without opening them in Word or Excel itself. Inparticular, the viewer software doesn’t support macros at all, so you can’t enablemacros by mistake! Malware that doesn’t come in via document macros often relies on security bugs in popular applications, including Office, your browser, Flash and more. The sooner you patch, the fewer open holes remain forthe crooks to exploit. Keep informed about new security features added to your business applications. Forexample, Office 2016 now includes a control called "Block macros from running inOffice files from the internet" which helps protect you from external malicious content without stopping you using macros internally. Open .JS files with Notepad by default. Show files with their extensions. Malware authors increasingly try to disguise the actual file extension to trick you into opening them. Avoid this by displaying files with their extensions at all times.